Charles Clifton can see a steel frame building going up outside his window. It’s the new Auckland University engineering school redevelopment. It’s called ‘B405’ and he says thanks to the university’s wish to “express the structure for the benefit of engineering teaching and research” it has leading edge steel work that is highly engineered and as advanced as you’ll get anywhere worldwide. Associate professor Charles Clifton is known as a key industry thought leader in steel. He’s involved on the technical, design side of steel and is actively involved in the reviews and updates of various standards and design guides, for not only the technical part of the design, covering what the design engineers do, but the fabrication, erection and construction of buildings in New Zealand and beyond. In the wake of New Zealand’s recent earthquakes, he’s heavily involved in the development of more resilient steel structure buildings. 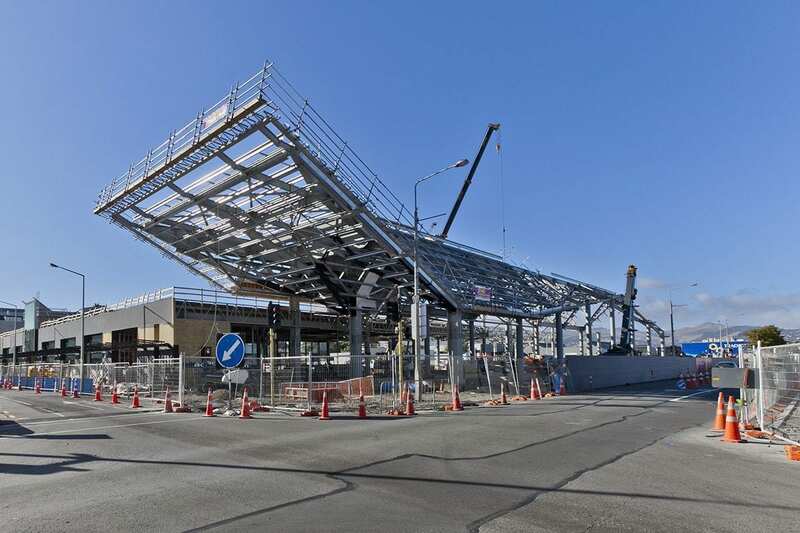 He teaches engineering students on a four-year degree at Auckland University, taking them from the basics of steel civil engineering materials and design through to more specialist areas such as multi-story design, and structures and design. Charles is involved in a number of projects with students and academics from other universities, in New Zealand and overseas, that explore ways to build resilience in steel structures, particularly within an earthquake prone landscape. Charles says since the seventies the emphasis was on keeping the people in a building safe during an earthquake, while allowing controlled damage to the building. More recently there has been a call from clients to design buildings that maintain their structural and non-structural functionality after a severe earthquake, so they can be reoccupied rapidly following the event. “It’s sort of a bit like car owners telling the car makers ‘we want a car that we can continue to use after an accident, preferably that doesn’t cost any more than the standard car’ and that’s quite a challenge. There’s now a big focus on achieving this, ie in making new building systems more resilient. The second big focus is on understanding the residual capacity, strength and stiffness, of earthquake damaged buildings that were designed for controlled damage,” he says. Following the Kaikoura earthquake, which caused a lot of damage to modern concrete buildings in Wellington, Charles said there was an urgent need to find more about the post earthquake performance of those buildings. Charles’ own PhD involved a ‘sliding hinge joint’ he invented, which is a connection between a beam and a column within a rigid frame. He developed the first prototype, which worked well in testing in that prior to the earthquake and during, where it could slide effectively. The problem was it lost stiffness, so after the end of the earthquake you would have to retighten the bolts in the sliding system, to bring it back to it’s original preearthquake condition. “I have had an excellent student who’s been working on optimising that joint, so that you don’t have to do anything after the earthquake, it will go back to its original strength and stiffness. That’s been a major piece of work that’s now finished. Charles works closely with his counterparts at the University of Canterbury and AUT in all these areas and says this is very important given the scale of the issues and opportunities involved. The outputs from this team have put New Zealand at the forefront of steel seismic research worldwide.